Tanning in the beautiful outdoors is free, fun, and you get a chance to relax and unwind in the sun. A gorgeous tan can make you look healthy and gives you that glowing skin look. Many people have to spend a lot of time in the sun to get a perfect tan, some more than others! However, know the sun can harm just as well as make your skin healthy. It has not only excellent tanning qualities but also emits UVA and UVB rays that can cause health complications due to over-exposure. When that sun shows its face most people want to head outdoors to get that sun-kissed skin and tanning oils can help. 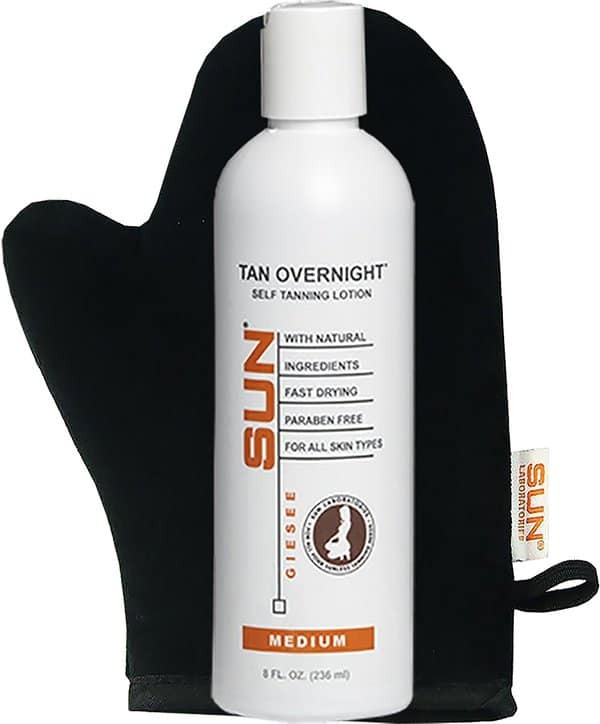 Most of these products are divided into two categories – indoor tanning lotions and outdoor tanning lotions. Indoor tanning lotions are ones that do not require time under the sun you. Outdoor tanning lotions and creams accelerate the tanning process and help get you that sun-kissed look faster. With so many products available in the market like lotions, mousses, gels, oils, spray tanning products, and accelerators and bronzers, it may become difficult to select the best one for your skin and texture. Fair-skinned people face a lot of issues with tans and maintaining them for a period. Since different people have varied skin types and conditions, it is always best to select a tanning lotion that is most suitable to your texture, dryness or oiliness and skin condition. Most outdoor tanning lotions are made using natural oils and naturally occurring ingredients that nourish the skin and keep it moisturized. Tanning lotions and oils help keep the skin hydrated all day long while you can accelerate the tanning process on the surface. In case the tanning lotion you select does not include SPF, you can apply a thin layer on to your skin before you use the tanning lotion. Also consider that tanning lotions can block your pores, if you suffer from acne it may be worth investing in some acne face wash to prevent breakouts. With the help of many beauty specialist and frequent tanners we’ve been able to put together a list of the top picks for tanning lotions, we’ve also put them into price order so it makes for an easier read, so if you want to spend little start here, if you want to really invest in your lotion scroll to the bottom. 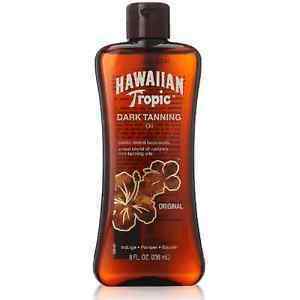 Hawaiian Tropic Dark Tanning Oil Original Contains antioxidants to fight irritation & moisturises skin. 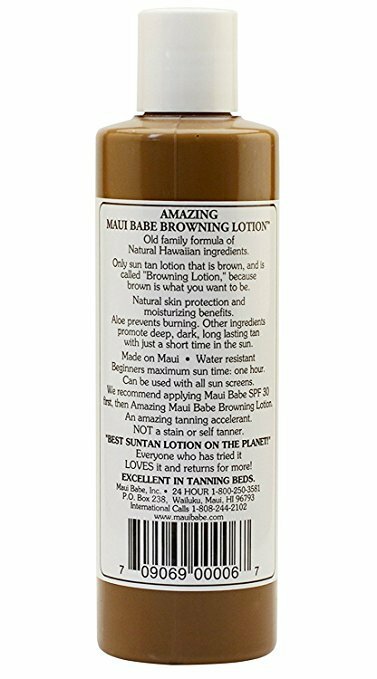 Maui Babe Browning Lotion Non oily, for all skin types, offering a deep tan. Millennium Tanning Paint It Black 50X Rapidly darkens skin, contains silicon emulsion to make skin feel soft and fight raging effects. Australian Gold Gelee Dark Tanning Accelerator with Hemp Seed Lotion Contains hemp seed oil and antioxidants to reduce irritation and increase skin health, smells nice! Supre Smoke Black Bronzer, Tanning Lotion Oxygen regenerating system for quick tanning & packed with vitamins and minerals. 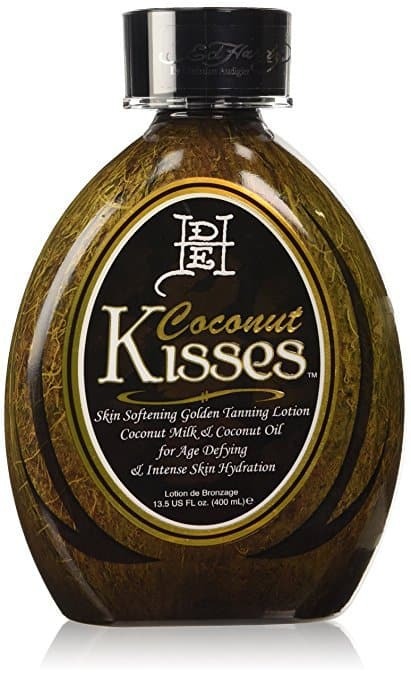 Ed Hardy Coconut Kisses Golden Tanning Lotion Contains coconut milk & oil, gives an intense dark tan. 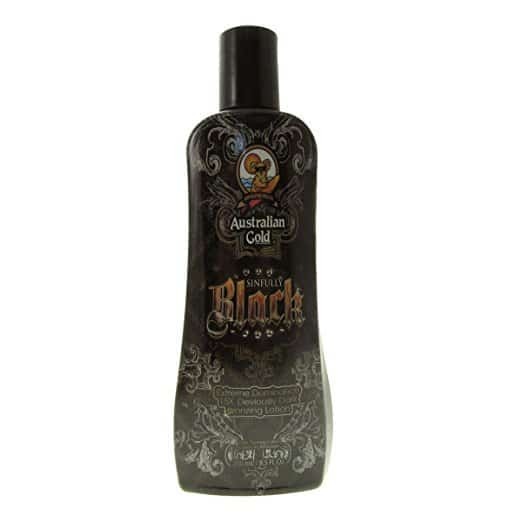 Australian Gold Sinfully Black 15x Deep Dark Bronzing Tanning Lotion Quick tanning, rich in hemp oil, walnut shell, caramel, kukui nut & sunflower oil. Supre – Snooki Ultra Dark 70X Black Bronzer Contains henna, black walnut /& aha which allow skin to darken even after UV exposure, giving a deep tan. 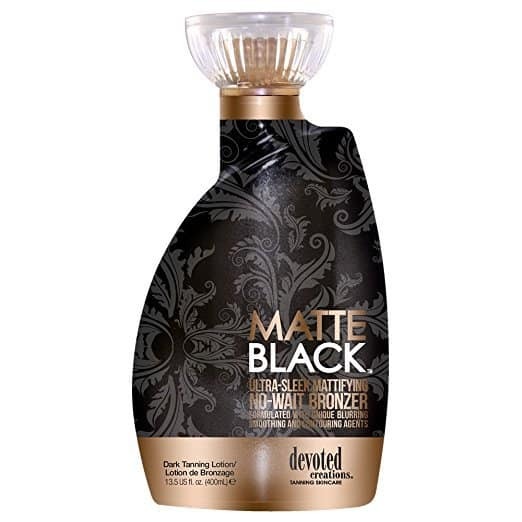 Matte Black, Ultra Sleek, No Wait Tanning Bronzer Lotion Contains DHA charcoal extract & natural cosmetic bronzers for quick beautiful colour tan. 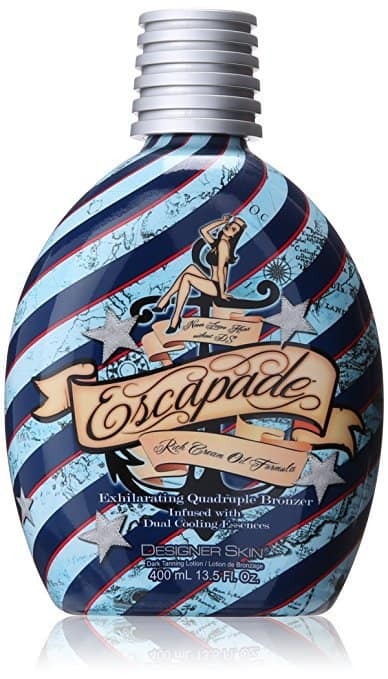 New Sunshine Designer Skin Escapade Bronzer Quadruple bronzing effect & cooling essence for a quick and safe tan. 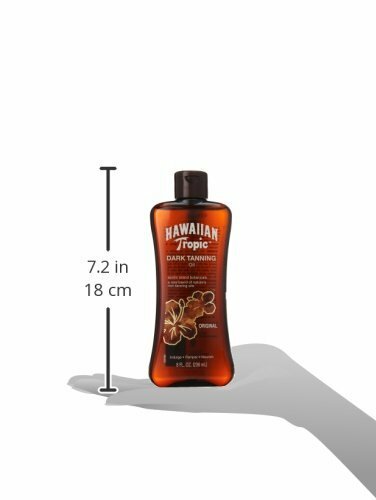 First on our list is the Hawaiian Tropic Dark Tanning Oil Original. With a light coconut fragrance that is mild and tropical feeling, you feel soft and sleek while you bathe. The Hawaiian Tropic Dark contains antioxidants vitamin A, C and E that help fight skin irritation from the sun and promotes good skin health. This tanning oil also contains conditioning and moisturizing properties to make your skin supple and protect it from the drying effect of the sun. There are alternative versions of Hawaiian Tropic Dark Tanning Oil which contain moderate levels of SPF if your skin burns easily but you are desperate for that glowing look. Against the skin the oil is smooth like silk, it is quickly absorbed into the skin. With botanical ingredients, the tanning oil also contains elements from the Hawaiian Islands that make your skin feel pampered, smooth, and well-hydrated. The only thing you need to be aware of is that the price of this product tends to increase during summer, so it is best to stock up on your tanning oil while the cost is low. The Maui Babe range of products is made from olden Hawaiian family formulas that are known to impart a dark, natural, yet gorgeous color. The components of this formula make it non-greasy, non-oily and light on the skin. 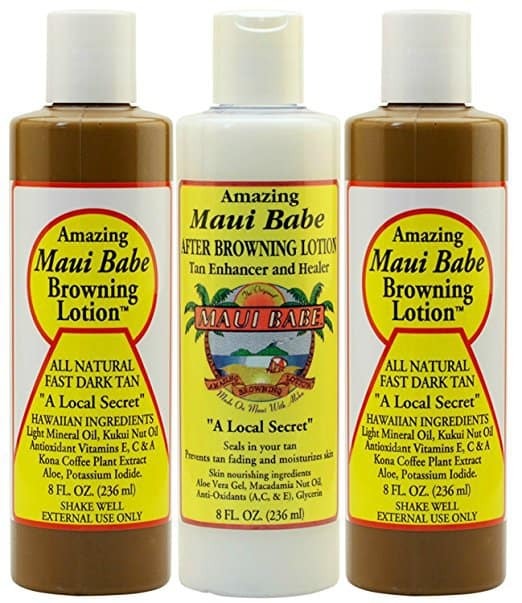 Maui Babe Browning Lotion is safe for all skin types even the fairest and most sensitive and combined with any SPF and still works fabulously on lighter skin tones. The smell is one of coffee and can be slightly overwhelming, but not unpleasant. 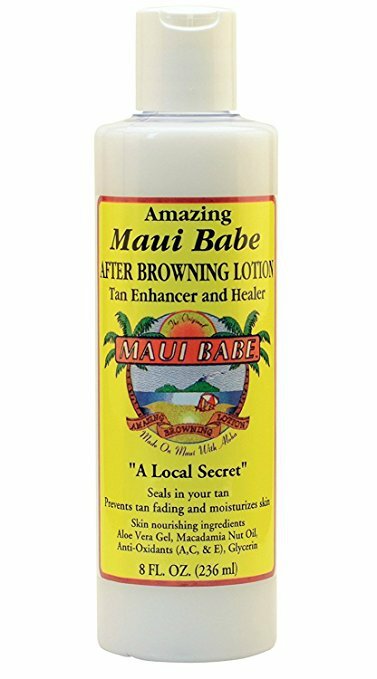 The Maui Babe lotion does not contain any antioxidants or other special ingredients but does offer a deep tan and is very popular among tanners. Though the Maui brown can clog pores so if you’re prone to acne this is not the lotion for you and may cause you to end up in breakouts, so do not use it in your face if you do get it! The Millennium Tanning Paint It Black 50X is for people who need a quick tan in the least amount of time. The 50X auto-darkening technology that Millennium has infused in this product rapidly darkens skin. The formula contains silicon emulsion to make the skin feel soft, whilst fighting the signs of aging and reducing cellulite to give a firm look. The ingredients and formulation of the Millennium Tanning Paint It Black 50X do the work of creating an envious tan by accelerating, firming, and bronzing in a short span of time. The Millennium Paint it Black fragrance is a pleasant one and is reminiscent of fresh cotton blossoms, ideal for avoiding insect attraction. 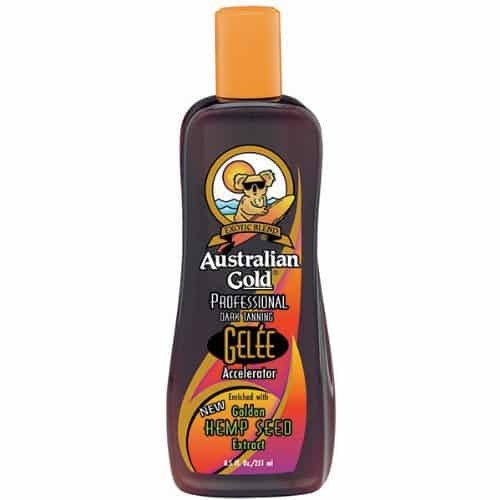 The Australian Gold Gelee Dark Tanning Accelerator is also a versatile lotion like the Maui Babe Browning Lotion and can be used indoors and outdoors. It has a light feel to it and does not feel sticky on the skin. Gelee Dark contains hemp seed oils as well as the antioxidants vitamins A and E to improve skin health and reduce irritation. Most users have claimed that they can go on the whole day without washing this lotion off since it is light and pleasant smelling. 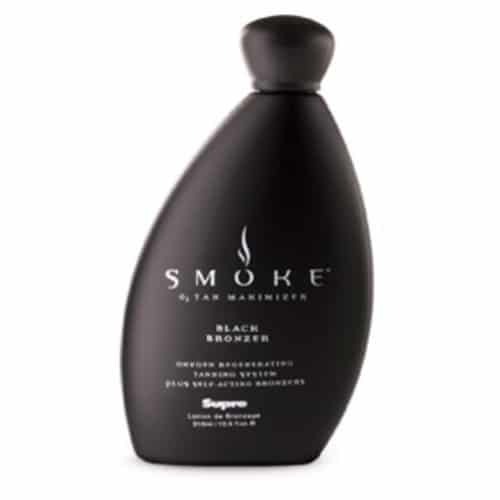 The Supre Smoke Black Bronzer Tanning Lotion has a unique oxygen regenerating system for quick bronzing. 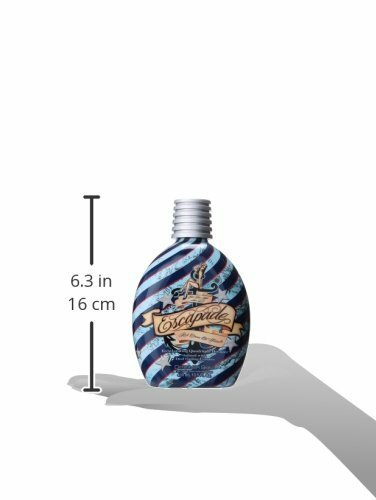 This water-based tanning lotion has a non-tingling formula and is exceptionally comfortable on the skin. With self-acting bronzers and a method for maximizing a dark tan, the Supre Smoke Black is packed with vitamins and minerals to leave the skin feeling soft, smooth, hydrated, and supple. It also helps in reducing the appearance of fine lines and wrinkles. This product is recommended for both men and women who like deep and advanced tans. It also has mango, pineapple, and passion fruit fragrance that is pleasant to the nose. The Ed Hardy Coconut Kisses Golden Tanning Lotion is a pampering lotion that gives your skin a luxuriant feel. This lotion promotes exceptionally soft skin with a perfect blend of coconut milk and coconut oil and doesn’t stain or streak. 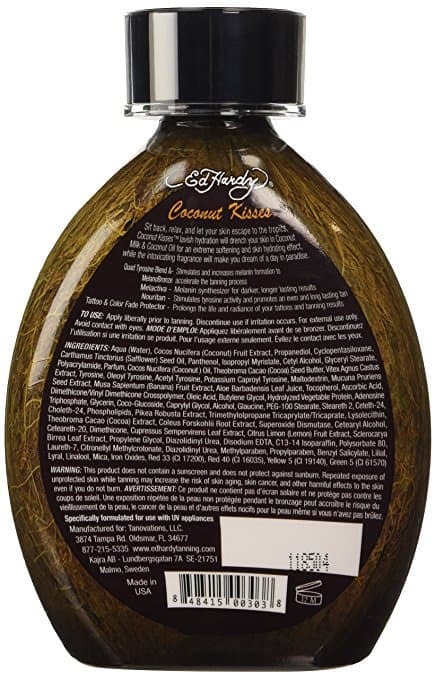 Ed Hardy Coconut Kisses is known for its unique and intense deep golden hued tan because of its tanning intensifiers. Without bronzing agents, the formulation of this lotion contains Melactiva which accelerates the tanning process by stimulating melanin, so you have to spend less time waiting for your dream tan. This product is known to protect tattoos from discoloration and fading. The formulation also promotes the natural pigmentation of the body to remain darker for longer thereby promoting a longer lasting deep tan. Another product from Australian Gold makes it to our list! 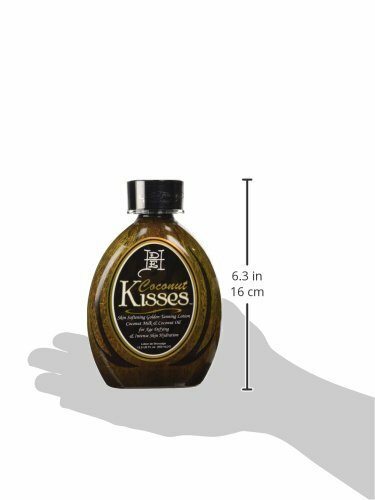 The Sinfully Black 15X Deep Dark Bronzing Tanning Lotion has been reported to aid in building a golden brown base tan in as little as two weeks. More expensive than the Australian Gold Gelee, this product is known for its superior natural-looking bronze effect. It has a perfect bronzer that is excellent for an even tone throughout the body. Sinfully Black contains natural ingredients rich in hemp seed oil, walnut shell extract, caramel, kukui nut oil, and sunflower oil that help keep skin hydrated and soft. The combination of these natural ingredients gives Sinfully Black a smell just like tropical fruit. Supre Snooki Ultra Dark 70X Black Bronzer is as effective as the Supre Smoke Black Bronzer Tanning Lotion mentioned earlier on our list. This product from Supre contains henna, black walnut, and DHA that allows the skin to continue darkening even after exposure to UV. The resultant tan is thick and dark turning a rich golden color. Ultra Dark contains a spectacular HyperDark technology by Supre that starts acting as soon as it is applied to the skin for fast acting results. Ultra Dark Also contains a skin conditioner enriched with vitamins and minerals that help keep the skin radiant and healthy looking with a natural glow for more extended periods of time. A unique skin firming formula in the product helps keep the skin smooth and supple with a toned and tight look and feel. The Snooki Ultra Dark 70X also contains coconut and almond oil that gives it a pleasant fragrance. This deep and dark tan stays for approximately 8 to 10 days. If you are looking for excellent quality and color tanning lotion, look no further than the Matte Black Ultra Sleek No Wait Tanning Bronzer Lotion. 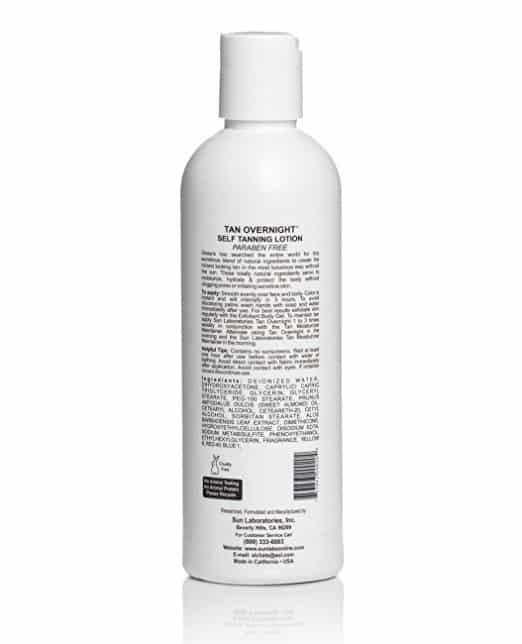 With an incredible color, this lotion makes your skin look radiant with a silky smooth texture. The fabulous hydrating properties of the No Wait Tanning Bronzer from Matte Black leave your appearance with an airbrushed look and zero streaks or orange appearance. Slightly on the expensive side, this lotion contains DHA and natural cosmetic bronzers for a fast-acting tan. With tattoo and color fade protectors, this lotion protects the texture and feel of body tattoos. It also contains a charcoal extract that absorbs excess oils produced during the tanning process. Another great aspect about the No Wait Tanning Bronzer is that it boosts collagen production in the skin to promote firmer and younger looking skin. The New Sunshine Designer Skin Escapade Bronzer is one of our favorites on this list. Higher on the price point than other outdoor tanning lotions, the Designer Skin Escapade has superior ingredients for luxurious skincare. The unique blend of the Miracle Collection provides users with a compelling age-defying experience that makes skin firmer and younger looking with a stunning golden hued bronze that is enviable. The quadruple bronzing effect in this bronzer leaves skin looking sun-kissed in the most natural manner possible. Sunshine Designer also has a dual cooling essence that keeps the skin fresh and comfortable even under the harsh sun. With ATO inhibitors and a cream oil formula, this product boasts a Bermuda breeze fragrance that many users have liked. Long lasting with a deep and dark tan, the Designer Skin Escapade can be used outdoors or in a tanning bed for optimum results. When it is summer, and you want the best tan without extra exposure to the sun, you simply must grab one of these outdoor tanning lotions. Tanning lotions not only give superior tans but also ensure that your skin remains hydrated and moisturized while being protected from the sun. Excess time spent in the sun can harm your skin, cause skin conditions and might even make you susceptible to skin cancer. Outdoor tanning lotions and oils with a little SPF help protect your skin. If you suffer from nail fungus, it can be embarrassing to sit outside in the sun and work on your tan, read our top picks for nail fungus treatment. Select products according to your skin type. People with oily skin should opt for water-based lotions to prevent acne and breakouts while people with dry skin should choose those with moisturizers and hydrating effects. 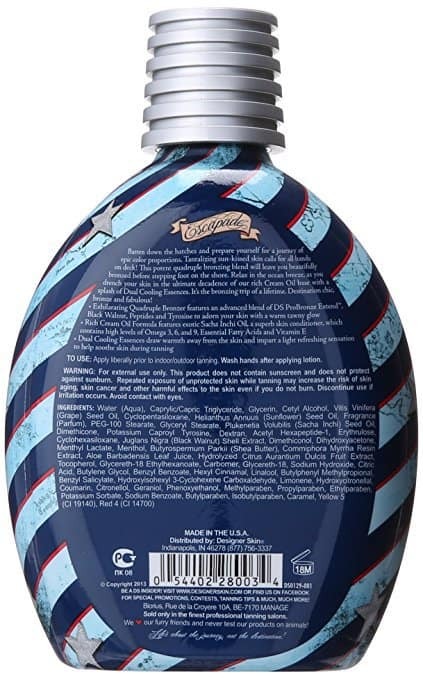 This list is meant as a guide to help you select the best outdoor tanning lotions as per your requirement and budget. Outdoor tanning lotions and oils are best for people who want to maintain a balance between tanned and glowing skin and healthy skin. Outdoor tanning lotions are a boon for people wishing to get a beautiful sun-kissed look while increasing the moisturization of the skin. Outdoor tanning lotions are great for use on the beach and at the poolside. If you plan on enjoying all the benefits of the full sun, then an outdoor tanning lotion would be ideal for you. These products help shorten the time taken to get a healthy tan glow to the skin while protecting your skin from excessive sun damage. Outdoor tanning lotions are available for all skin types and come specially labeled for oily, dry, sensitive, and combination skin types. Different formulas of outdoor tanning lotions are available depending on the tone you would like your skin to have – medium, dark, olive, and so on. You can also opt for an outdoor tanning lotion that doubles as an anti-aging lotion. Another favorite outdoor tanning feature is the tattoo protection composition that is very useful for people who have tattoos on their bodies. Let us help you make an informed choice about the best one for you. Outdoor tanning lotions are made specially to protect your skin from harmful UVA and UVB rays of the sun. The sun protecting factor (SPF) helps prevent the skin from absorbing ultraviolet rays that can cause severe issues to the skin and may deteriorate your health to a great extent. Extreme cases of sun damage have also resulted in skin cancer. Before finalizing an outdoor tanning lotion, always ensure that the ingredients contain a healthy dose of SPF. Several outdoor tanning products help achieve what you want but end up drying the skin out. If you have dry skin, or if you start to feel itchy in the sun, you should opt for an outdoor tanning lotion with moisturizers already present. Purchasing a lotion that helps in moisturizing your skin will stop it from cracking, flaking, or getting itchy while you are getting a tan in the sun. You will also feel less dehydrated and will be able to get the tan you want. While many people think this is not very important, some lotions and creams do not work at their best in the heat of the noonday sun. If you are planning to sunbathe from 10 am to 3 pm, it would be wise to select an outdoor tanning lotion that helps develop faster on your skin and works under strong sunlight. If you plan to gently tan over a few days by a less harsh sun, you should opt for a mild tanning lotion that works over time. For such people, investing in an accelerator and maximizer can help get an even tan. As with any beauty treatment, product, lotion, or cream, you must keep a reign on the cost. Factor in the value of your annual tanning treatments and compare it against the cost of a weekly tan, to get an estimate of your tanning budget. Now, check this price against a bottle of cream. You will find that it is more economical to invest in an outdoor tanning lotion than spend a lot of dollars and pounds on indoor tanning salons. While some lotions and creams may be more expensive than others, there are several reasons for the increase in price. The features and added benefits increase as the quality and cost of the product goes higher. Outdoor tanning lotions that help nourish and protect the skin from damage while simultaneously providing UV protection might be higher than regular tanning lotions. While you may feel that all tanning lotions, creams, and gels are the same, the ingredients in each change significantly. Accelerators use ingredients that help melanin develop when exposed to direct sunlight. These are great for first-time tanners. Accelerators also contain a healthy dose of moisturizer. Bronzers or Maximizers are for people who enjoy getting outdoor tans and also have a good base color. Beginners and advanced tanners can quickly adapt to a deep tone with the help of a bronzer. Additional sun exposure will deepen the existing tan by darkening the skin beneath it. These products contain less moisturizer, but more SPF to help protect your skin from damage. Some bronzers come with tattoo protection and anti-aging benefits to protect your skin from becoming wrinkled and stretchy with tanning. Apart from just these points, it is always a good idea to exfoliate your skin and moisturize it before you start any tanning process so that you remove all dead skin, blocked pores and cells to get an even tan.